Many in the scientific community believe that if the American public were more informed about the science behind climate change and energy issues, people would hold views that aligned more closely with those of scientific experts. But how much people know about science only modestly and inconsistently correlates with their attitudes about climate and energy issues, while partisanship is a stronger factor in people’s beliefs, according to a 2016 Pew Research Center survey . There have been wide political divides in public views over climate and energy issues over at least a decade of public polls. The 2016 survey showed these political divisions reached across every dimension of the climate debate, from the causes and potential cures of climate change down to people’s trust in climate scientists’ understanding of the issue and the motivations behind their research. These political orientations appear to serve as an anchoring point for how knowledge influences peoples’ attitudes. This pattern is consistent with an array of scholarly literature which suggests that people’s political worldviews shape how science knowledge influences attitudes on climate-related matters. People’s level of science knowledge helps to a degree to explain their beliefs about climate change, but the relationship is complicated. While there are wide political divides in public views of the potential for harm from climate change. A majority of Democrats holding medium or high levels of science knowledge said it was “very likely” that climate change would lead to rising sea levels that erode beaches and shore lines, harm to animal wildlife and their habitats, damage to forests and plant life, storms that are more severe, and more droughts or water shortages. But there are no differences or only modest differences among Republicans holding high, medium and low science knowledge levels in their expectations of harms to the Earth’s ecosystems because of climate change. 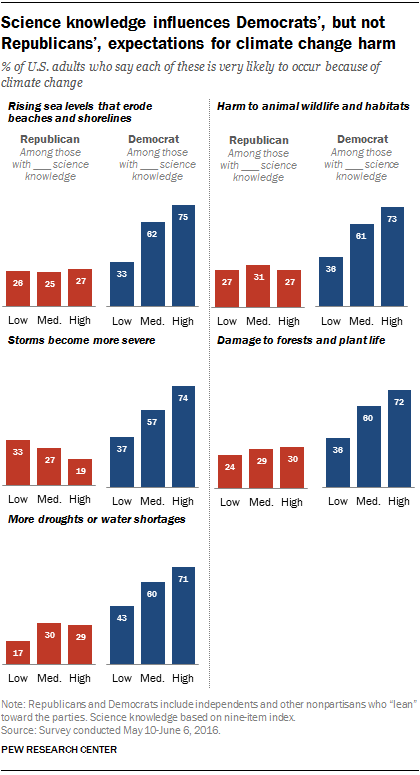 Similarly, Democrats with high levels of knowledge about science, based on a nine-item index , almost all agree that climate change is mostly due to human activity (93%). By contrast, 49% of Democrats with low science knowledge think this is the case. But among Republicans, there are no significant differences by science knowledge about the causes of climate change. Put another way, Republicans with high levels of science knowledge are no more likely than those with lower levels of knowledge to think climate change is mostly due to human activity. The same pattern was found for people’s beliefs about energy issues. The survey found that Republicans more than Democrats favored expanding fossil fuel energy sources, as has been the case in past Pew Research Center surveys. The 2016 survey found that the vast majority of Democrats with high science knowledge opposed expanding offshore oil drilling, fracking and coal mining. Democrats with low science knowledge were more closely divided over these issues. Republicans’ views about these energy issues were about the same regardless of their level of science knowledge. On nuclear power, the pattern was reversed. Three-quarters (75%) of Republicans with high science knowledge favored more nuclear power plants, compared with 37% of Republicans with low science knowledge. There were no more than modest differences among Democrats by levels of science knowledge in their opinions about more nuclear power plants. People’s level of science knowledge influenced their attitudes and beliefs about a number of climate and energy issues but, most often, the relationship was indirect. Political orientations – whether Democrat or Republican – appeared to shape how people integrated science knowledge with their attitudes and beliefs about climate and energy issues.